Subscribe to get deals from hundreds of merchants including the best of Expedia.com.hk! Receive HKD400 airport transfer discount voucher upon spending of HKD9,500 or above in a Flight + Hotel package booking. The offer is valid until 15 July 2019. Get the offer. Please always check with the merchant on the validity of the promotion before purchase. Expedia offers up to 9% off on hotel bookings with Citi Card. The offer is valid until 31 December 2019. Enter the promo code at the checkout to get the offer. Please always check with the merchant on the validity of the promotion before purchase. Expedia offers 9% off on hotel booking with DBS Credit Card. The offer is valid until 31 December 2019. Enter the promo code at the checkout to get the offer. Please always check with the merchant on the validity of the promotion before purchase. Expedia offers an extra 12% off on selected hotels with your BEA Mastercard for a minimum of 2 nights stay. The offer is valid until 30 June 2019. Enter the promo code at the checkout to get the offer. Please always check with the merchant on the validity of the promotion before purchase. Expedia offers up to 12% Off On Hotel Bookings With Mastercard. The offer is valid until 30 April 2019. Enter the promo code at the checkout to get the offer. Please always check with the merchant on the validity of the promotion before purchase. Expedia offers up to 9% off with BEA Credit Card. The offer is valid until 30 April 2019. Enter the promo code at the checkout to get the offer. Please always check with the merchant on the validity of the promotion before purchase. Expedia offers up to 9% off hotel booking if you are a Dah Sing Credit Cardholder. The offer is valid until 12 December 2019. Enter the promo code at the checkout to get the offer. Please always check with the merchant on the validity of the promotion before purchase. Expedia offers an extra 9% off on hotels with BOC Credit Card. The offer is valid until 30 April 2019. Enter the promo code at the checkout to get the offer. Please always check with the merchant on the validity of the promotion before purchase. Expedia offers HK$150 off on package booking with Standard Chartered Card. The offer is valid until 30 April 2019. Enter the promo code at the checkout to get the offer. Please always check with the merchant on the validity of the promotion before purchase. Expedia offers up to 10% off on hotel booking with Standard Chartered. The offer is valid until 30 April 2019. Enter the promo code at the checkout to get the offer. Please always check with the merchant on the validity of the promotion before purchase. Expedia offers up to 9% off Hotels Bookings with HSBC Card. The offer is valid until 30 April 2019. Get the deal. Please always check with the merchant on the validity of the promotion before purchase. Expedia offers up to 15% off hotel bookings when you checkout using HSBC Premier Mastercard. The offer is valid until 31 December 2019. Get the deal. Please always check with the merchant on the validity of the promotion before purchase. Expedia offers up to 9% off on hotel bookings with HSBC Card. The offer is valid until 30 April 2019. Get the deal. Please always check with the merchant on the validity of the promotion before purchase. Expedia offers up to 63% off on your Getaway booking. The offer is valid until 30 April 2019. Get the deal. Please always check with the merchant on the validity of the promotion before purchase. Hong Kong Hotels Sale: Book & Get Up To 50% Off. The offer is valid until 30 April 2019. Get the deal. Please always check with the merchant on the validity of the promotion before purchase. Expedia offers up to 60% off while booking a flight + hotel. The offer is valid until 30 April 2019. Get the deal. Please always check with the merchant on the validity of the promotion before purchase. Book hotels in most-loved destinations & save up to 52% off. The offer is valid until 30 April 2019. Get the deal. Please always check with the merchant on the validity of the promotion before purchase. Book hotels worldwide & get up to 40% off. The offer is valid until 30 April 2019. Get the deal. Please always check with the merchant on the validity of the promotion before purchase. 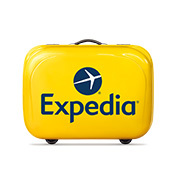 up to 35% off on hotel booking with Expedia. The offer is valid until 30 April 2019. Get the deal. Please always check with the merchant on the validity of the promotion before purchase. Expedia.com.hk offers a saving discount for all its members. Please check from the link provided to search for all discounted bookings available. Up to 50% off hotels/ flights/ packages bookings. Limited to selected hotels/ flights. T&C apply. Please always check with the merchant on the validity of the promotion before purchase. The offer can only be used once. Promo code can be obtained by entering your email address at https://www.expedia.com.hk/couponsignup?campaignId=newuser&mcicid=NewToExpedia_532x299#ReferralSignupView. T&C apply. Please always check with the merchant on the validity of the promotion before purchase. Book a minimum of 5 nights and save 35% on selected hotels. For all Stay Longer deals, see the merchant's website for details. T&C apply. Please always check with the merchant on the validity of the promotion before purchase. Expedia offers an extra 12% off on hotel bookings with Mastercard. The offer is valid until 15 February 2019. Get the deal. Please always check with the merchant on the validity of the promotion before purchase. Expedia offers up to 15% Off On Hotel Bookings with HSBC Cards. The offer is valid until 31 December 2018. Enter the promo code at the checkout to get the offer. Please always check with the merchant on the validity of the promotion before purchase. Expedia.com.hk offers HSBC card owners a discount of 10% off on hotels in Hong Kong/Macau, India, Indonesia, Malaysia, Singapore and Vietnam, 9% off on hotels in Taiwan and 8% off on hotels in the Philippines. The promotion is valid until 31 December 2018.. Please always check with the merchant on the validity of the promotion before purchase. Expedia.com.hk offers 15% off hotel bookings for HSBC Premier Mastercard holders. Booking Period is from now to 31 December 2018. Travel Period is from now to 31 March 2019. Enter HSBC Premier Mastercard® coupon code at check out page to enjoy 15% off hotel bookings. The offer will be applied to the first 2,500 bookings each month using a HSBC Premier Mastercard® to book. Each account can enjoy maximum 2 times of the offer each month. T&C apply. Please always check with the merchant on the validity of the promotion before purchase. Expedia.com.hk offer a discount of 15% off on hotel bookings with your HSBC Premier Mastercard®. The promotion is valid until 30th April 2018 for travel by 31st July 2018. T&C apply.. Please always check with the merchant on the validity of the promotion before purchase.